Many times a student-athlete is referred to as versatile. Brookfield Central junior Sasha Semina takes that word to another level. 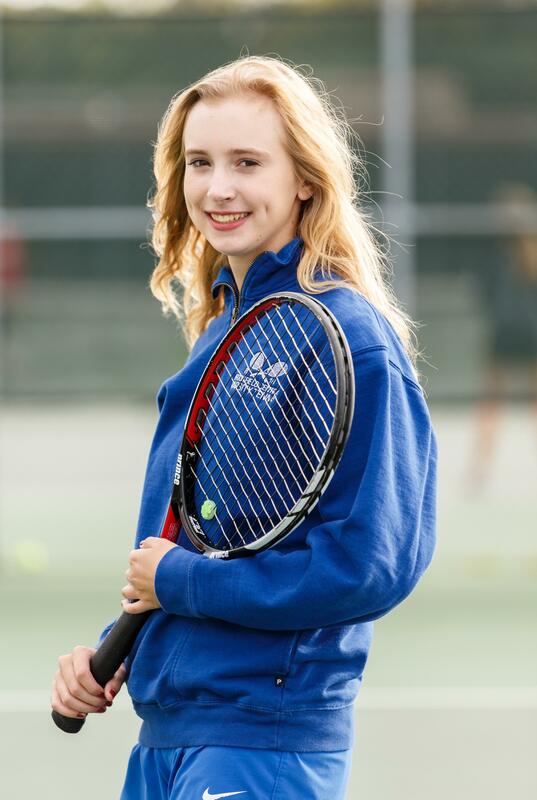 When Brookfield Central girls tennis coach Dave Steinbach needs someone to play the piano or compose music, all he has to do is look to Sasha, his No. 1 singles player, who also has a background in ballet. "I play piano, I compose music, song write," Semina said recently before a Lancers practice when she sat down to do this interview with me. "They are big passions of mine. I also like writing. creative writing, writing stories." No one in Sasha's family played tennis (competitively), only recreational. "Ballet wasn't going too well for me - ballet is really cool. Tennis, when I would watch it, I would see these players have awesome determination; they would fight through anything. They would never give up. They were amazing role models. I just loved watching all these players. I said 'I can do that.' I did have a lot of fun when I played. Looking at those matches where tennis is just so mental. Really, it's just like a battle. I thought it was really cool." Semina started taking group lessons initially, then got involved in competitive tournaments. "I'm very competitive," Sasha said. "I'm not over the top, but winning is very important to me. I want that winning mentality because losing feels pretty terrible." Semina initially met Steinbach at his Warhawk Camp at UW-Whitewater and brought a smile to his face when she told him she was coming to Brookfield Central. "I love coach Steinbach. This is my third year on the team with him," Sasha said. "I met him at Warhawk in seventh grade. He asked me what school I wanted to go to and I said Brookfield Central. He said 'Oh really.'" Steinbach heard nothing but good things about Semina. "People told me 'You're really going to get a good one.' And I did." he said, breaking into a smile. "That made my day." She was second team All-Greater Metro All-Conference as a freshman and honorable mention as a sophomore. She was second-team All-State and team Most Valuable Player as a freshman and sophomore. She had a combined 48-21 record her first two seasons, a .696 winning percentage playing No. 1 singles. Sasha enjoys being the Lancers top player, but doesn't like the pressure that comes with it. "I love being No. 1," she said. 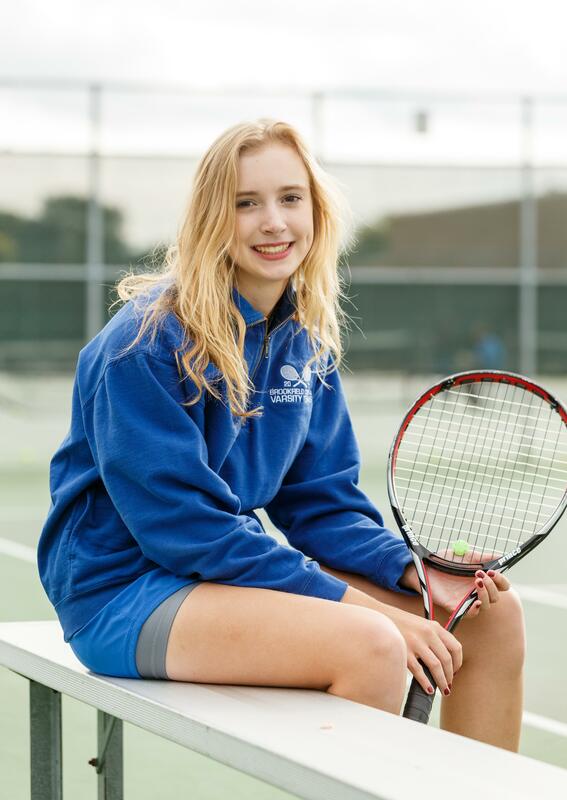 "It's a really awesome honor for Brookfield Central which really has a great tennis program under THE coach Steinbach. But it also brings a lot of anxiety with it because I have to play the best player." A lot of times it will come down to my match. A lot of people really pay attention to the No. 1 singles players and their scores. It also qualifies for state. I also do tennis outside of school - USTA tournaments - sometimes it's really hard because I have got too much in my head because tennis is so mental. Once that happens, you can really get in a rut. "A lot of times because I've really gotten used to it, I do well under pressure. Sometimes pressure is good, but if you do lose, you have to get over it. A loss is always hard, but you always move on. Pressure is good because pressure drives me to be better." Sasha says she's aware of why she plays tennis. "I'm doing tennis for myself for fun," she said. "You have to remember your love of the game. Sometimes when I played a little too much competitively when I was younger, you kind of lose sight. Tennis no longer becomes fun. It becomes a chore. You kind of dread it. "But then you go out and hit with your friends and you realize this is such a great sport. I'm so lucky to be playing it. Dealing with the pressure, I have to do a lot of little mental tricks. I have to look at a lot of sources like books or go online. I have routines on the court before my matches. I have to make sure I'm ready." Steinbach is well aware of this, but he feels Sasha handles the pressure well. "I think it bothers her, but she wins her matches," the veteran coach said. "When she plays someone really good, she competes very well. She doesn't display it (pressure), but internally it bothers all of us. She is very composed. She has very good rituals. She probably has the best rituals of almost any player I've had." Steinbach then explained Semina's rituals. "Between points, she'll come back to the fence and make's sure she is really ready," he said. "That keeps her from rushing. She's a grunter on her swing, which is what I want all my players to do. She is a good example of breath control and that keeps her from getting nervous. It helps your timing, it helps your strength. Ritual and breath reduces her anxieties." Ironically, according to Steinbach, Semina is the total package, on and off the court. "Her ability isn't what's the most important thing for her on this team," he said. "The fact that even though she is the best player, she socializes with everyone on the team. She hits with everyone on the team. "She treats them well, as equals, which is a really valuable asset to have. Sometimes your elite players are a little stand-offish." Sasha talked about how much her teammates mean to her. "It's awesome, so much better than being on your own," she said. "If you lose you have someone to talk to. This team's amazing. We're all so close. "They're all wonderful girls. They all have so much potential. They're already good players. "It's like I don't really want to win for myself, but I want to win for my team. I love cheering for my team members. It's so much fun; being there for your teammates, who are some of your closest friends. I love it." Both Steinbach and Semina agreed about her strong points as a player. "She has a lot of variety in her game," he said. "She doesn't hit shots the same in a rally. She will give you under spin, she'll give you short, give you deep. She is very crafty and she is also is an athlete, so she has good defensive skills. "She has more than one weapon, so she can watch her opponents, find out what they don't like and experiment. I ask her what her game plan is, she always has an answer. She is always massaging her opponent to find out what they don't like. She can come to the net. A lot of girls can't volley." Semina expanded on her coach's comments. "I'm also good at staying calm. It's hard to stay mentally tough during tennis matches," she said. "A lot of times you want to get down on yourself, but then you let your opponent back in the match. It can make all the difference. I've gotten a lot better this year, especially staying really calm, thinking through matches. My mentality is a big strength." Sasha is one of the team captains and she feels that is an important part to who she is. "Making sure I'm a good role model to my team because they're an awesome team," she said. "They're younger, so I want to set the best example. I also want to represent Brookfield Central and coach Steinbach the best that I can. He's known for having a good mental attitude. My main goal is just to have fun and not stress out." Steinbach says leadership is nothing new for Sasha. "She was a leader as a freshman already," he said. "She came in, very self-confident. She does other things (piano, composing music, writing) besides tennis that gives her a lot of self confidence. She doesn't strut her stuff. He is a leader by example. When she finishes her matches, she's there. She does all the team-bonding. "You would love to have one like that every year." FAVORITE FOOD: Beef, a really good burger. FAVORITE MUSIC/GROUP: Tom Waits (folk, rock, blues). Also likes Classical. FAVORITE MOVIE: Lord of the Rings franchise. FAVORITE TV SHOW: Stranger Things. WHAT DO YOU DO TO RELAX? Write, draw, listen to music. PET PEEVE: Poor sportsmanship on tennis court. Pretentious people. WHAT WOULD YOU LIKE TO DO IN THE FUTURE? Compose music and play tennis in college.